Prime Minister of Ukraine Victor Yanukovych is not satisfied with the work of the Government on stabilization of the prices at food market of the country. According to an UNIAN correspondent, he said this today at the session of the Cabinet of Ministers today. V. Yanukovych noted that the Government adopted the range of resolutions in this direction, but it is not fulfilled at the necessary level. “I observe carefully how our decisions are fulfilled. I am not completely satisfied with the work of the Economics Ministry in this direction. I do not see activity”, said the Prime Minister, turning to the Economics Minister Anatoliy Kinakh. Having noted that A. Kinakh was away on business recently, V. Yanukovych underlined that deputies Minister did not work actively in this direction. Turning to Vice Prime Minister Victor Slauta and Agrarian Industrial Complex Minister Yuri Melnyk, V. Yanukovych said that there is no activity from his side too. In connection with this the Head of the Government turned to first Vice Prime Minister – Finance Minister Mykola Azarov with the request to sum up the work for the week in the direction of prices stabilization and to make conclusions. He underlined that he does not see grounds to level up oil prices “not by times, but even by percents”. V. Yanukovych instructed profile ministers to establish order in pricing sphere. Turning to V. Slauta, V. Yanukovych underlined that the agrarian bloc has to forecast the situation at the foodstuff market and take timely measures together with other departments. 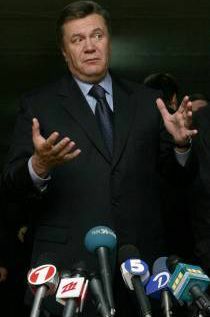 V. Yanukovych noted that he listened to leader of Antimonopoly Committee Oleksiy Kostusev concerning this issue, but this report did not satisfied the Prime Minister. A. Kinakh and M. Azarov said that in a whole the result of the work concerning the stabilization of the situation at the foodstuff market is positive, but the reducing of the prices, which is observed “does not suit us”. V. Yanukovych answered that nobody will give any medals for the effectiveness of the work.